Email is probably the number one way your business communicates. Email is now used to formally deliver important documents and is relied on for communicating. It is therfore imperative, you carefully track, file and control emails, as this is probably taking up more and more of your staff’s time. 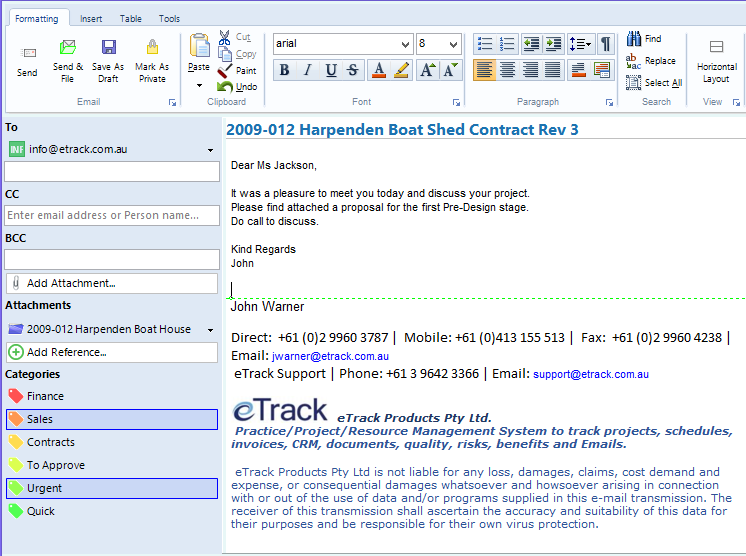 The eTrack project management system now has built in email. This means staff will typically have it open all day and in the same application have the project management tools to track time, budgets, resources, documents, contacts, quality and financials that will encourage their continued use. Keep your Inbox clear thanks to automatic and fast filing of emails and documents against projects and people etc. Share and send emails between staff without having to Forward. Select from a library of sample email templates. Maintain a fully filed transmittal of every email your company sends and receives. eTrack will synchronise emails with Personal Outlook, Outlook Exchange or any SMTP email system. 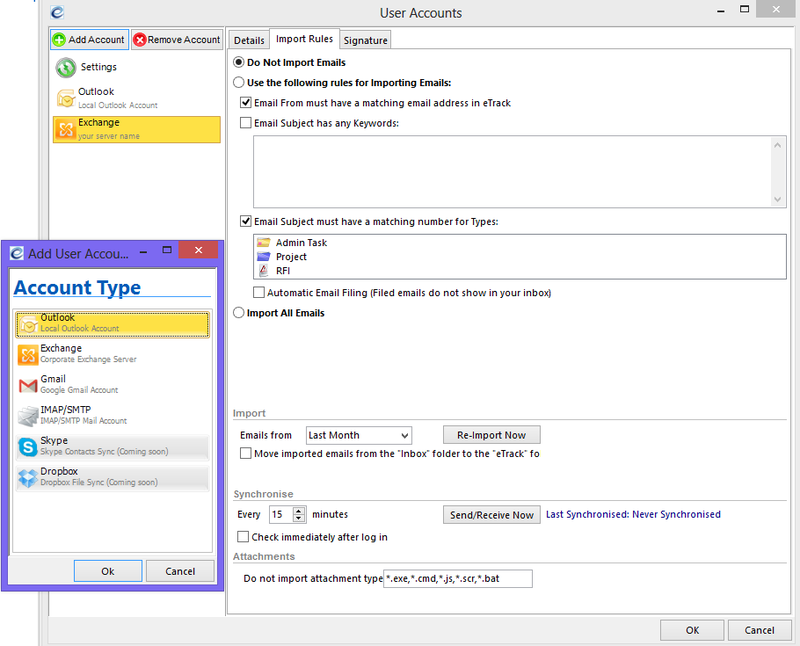 Coming soon is also any IMAP account interface that will allow email syncing also with Google mail, Hot mail, Yahoo mail, outlook.com, Entourage, Apple Mail, Microsoft Entourage etc. Built in Email will make filing, searching and tracking so much faster. Every few minutes eTrack will poll your email system and import emails that match user defined filters such as those matching an email address in eTrack, or those with the project number or user defined words in the email subject. Quickly empty your Inbox by first checking the References are correct and adding new ones if required, and then click to remove them from your Inbox. Emails are auto filed against projects, contacts and any other user defined reference you choose. Attachments are automatically filed on your file server. Tick any number of user defined categories to help you track. Select the Reference tab to see all emails associated with any selected branch of the eTrack tree such as a project, client or staff member. Select one or more Categories to further filter your search. Open any number of Email dialogs. Auto attach files and select contacts relevant to your projects. Auto file against the selected project and easily add any other references. Select one or more user defined Categories such as To Follow-up. On send, attachments are automatically filed on your file server. Email setup is intuitive and fast. Just select the Account Type, add a few details as shown below and create or paste in a signature. Optionally select to import all emails that match addresses in eTrack. Select to import emails with the project number in the subject. Define any number of other words to search the subject field for.